We can slash our budgets to bare bones, but the quickest way to reach our savings goal is to increase our income. This month, we are trying to reach $1000 in 31 days and if you already live a frugal life, you were probably already doing many of my tips. So the problem might not be the cash that is flowing out, but instead the lack of cash flowing in. Our problem isn’t spending, it’s income. 1. Find a Part-Time Job. Dave Ramsey is famous for telling his listeners to start delivering pizzas to claw their way out of debt. Years ago, a neighbor started delivering newspapers to increase their family’s income. She was a stay at home mother and the hours fit her husband’s work schedule. 2. Find a Seasonal Part-Time Retail Job. Many retailers hire extra workers for the holidays and different seasons. This is a great time to pick up a part-time job. 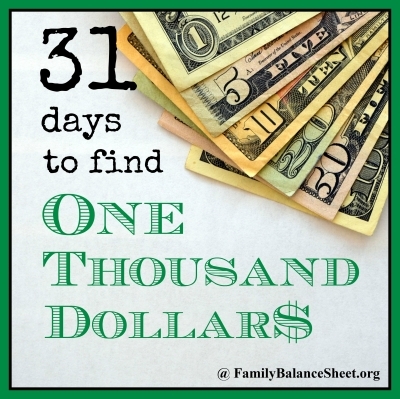 In September, my husband made $200 teaching private swimming lessons. Can you teach an instrument? Can you tutor? Can you coach a sport? What skills do you have where you can make money? Starting a direct selling business, like Thirty-One or Tastefully Simple, isn’t for everyone, but I have friends who have been very successful selling things like jewelry and food. It might be a good fit for a stay at home who needs to work their schedule around their’s spouse’s. You need to be comfortable selling, speaking in front of a group, and networking. Building a successful direct selling business does take initiative and time, but if you have the right personality, this could be a great option. Etsy, the online craft site, is built on people earning money from their hobbies. Are you good at photography? Do you knit beautiful scarves and mittens? Are you an amazing baker? Try selling your hobby at a local craft show to test the waters. Do you have an extra bedroom or is there an unused room above your garage? If this is an option, definitely seek counsel to help you write up an agreement and to find out your local laws. What can you do to increase your income? Let us know in the comments. I tried the direct selling myself as Shaklee distributor. It wasn’t a good fit for me, however, I have friends who have done well with other direct sales businesses like Creative Memories. I tried direct selling too for about a year. I stopped when I had my second baby and the company ended up folding anyway.